APT WGLC is pleased to announce contributions to the APT Student Scholarship Fund and the APT Student Engineering Competition Fund! Prior to the 2018 APT Annual Conference in Buffalo/Niagara APT WGLC donated $1,000.00 to support student participants. APT WGLC would like to thank our members and sponsors for their support. APT WGLC is pleased to announce that Sarah Lembke is the recipient of our 2018 Young Professional Scholarship! Sarah earned a Bachelor of Architecture from Iowa State University in 2015, and a Master of Science in Architecture – Heritage Conservation and Preservation from the University of Minnesota in 2017. While completing her studies, she worked as an Architectural Historian. She is currently an Architectural Intern with MacDonald & Mack Architects, where she has worked since 2016. Her favorite project to date is a Historic Structures Report for the Andrew Peterson Farmstead in Waconia, Minnesota. When she is not exploring historic structures, Sarah enjoys running in Track and Cross Country meets. 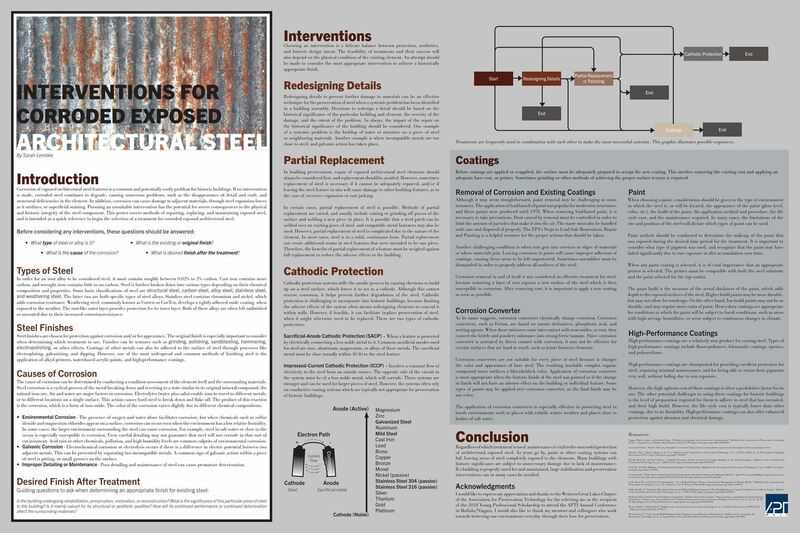 As part of the scholarship process Sarah submitted the poster below reviewing Interventions for Corroded Exposed Architectural Steel.